September 15, 2018, Amsterdam, the Netherlands – Yesterday morning, under sunny blue skies, His Holiness the Dalai Lama flew from Malmö to Rotterdam. 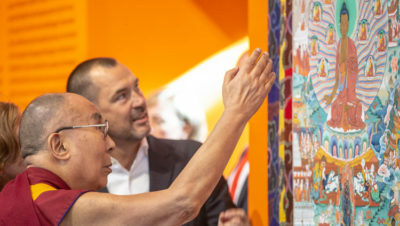 He was received at the airport by members of the Dalai Lama Foundation who have organized his visit to the Netherlands and drove into the city of Rotterdam. About 200 Tibetans, many of them children, and other well-wishers were gathered in front of the hotel to greet him as he arrived. His Holiness walked the entire length of the barriers on which they leaned to return their greetings. Tibetan dancers performed on the hotel forecourt. He was offered a traditional Tibetan welcome just by the door to the hotel. More people were gathered in the lobby inside. Once His Holiness reached his room, the Indian Ambassador to the Netherlands, H.E. Venu Rajamony and his wife paid him a brief courtesy call. His Holiness also met with four people representing a larger group of 12 alleged victims who say Tibetan Buddhist teachers have abused them physically or psychologically. They presented him with written accounts of what they say happened to them and appealed to him to address the problem. Moderator Christa Meindersma explained that there would be two panel discussions of about 40 minutes each: the first would focus on ‘Robotics and Telepresence’, while the second would deal with ‘Sickness, Aging and Death’. Christa Meindersma introduced scholar Prof Martin Steinbuch, who holds the Chair of Robotics at Singularity University, and practitioner Karen Dolva, the developer of AV1, the world’s first telepresence robot. A short video introduced Jade, in Britain, who suffers a chronic medical condition that prevents her leaving home for extended periods. The telepresence robot, which consists of a mobile head and shoulders, allows her to participate in classes at school even when she can’t go and enables her to stay in the loop with her friends. It has a two way audio connection, but only Jade, the operator, has access to a video feed. Her question to His Holiness was about whether there has been a female Dalai Lama and if not, could there be one in the future? His Holiness replied that he had been asked this repeatedly over the years and has answered that if a female body would be more useful, why not? He qualified this by adding that whether or not there will continue to be a Dalai Lama in the future is something Tibetans, Mongolians and people of the Himalayan Region will decide. When Christa Meindersma asked Jade what AV1 means to her, she was clear that it gives her freedom to go to school and keep up with her friends. Karen Dolva added that the telepresence robot, which can also be helpful to elderly people suffering Alzheimer’s syndrome, doesn’t replace human contact, but augments it and keeps it alive. Martin Steinbuch had brought a play robot with him, a dinosaur the size of a small baby. His Holiness explained that psychologist Richie Davidson of University of Wisconsin–Madison has undertaken a project to investigate what is going on. He pointed out that while technology can improve eye and ear consciousness, it has little effect on the subtler level of mental consciousness that nevertheless can be extended infinitely. Inner values involve the mind and ancient India was rich in understanding the mind’s workings as a result of the practices for cultivating a calmly abiding mind (shamatha) and analytical insight (vipashyana). The Buddha’s attainment was a product of such practices. Asked to talk about self-learning robots and whether they could develop empathy, Martin Steinbuch explained that they can learn rapidly about human behaviour and can develop acute intelligence. His Holiness asked if they could comfort someone who was sad and demoralized and he declared they could, somewhat to His Holiness’s surprise. As the first panel came to an end, His Holiness blew kisses to Jade via her AV1 telepresence robot. His Holiness retorted that it’s necessary to be realistic and the question represented unrealistic thinking. He observed that Indian Sadhus and others have tried to achieve such a goal through yoga and breath control, but none have lived more than 200 years. “Our earth will eventually disappear, our sun will disappear, even our galaxy will ultimately disappear, so it’s unrealistic to think we will avoid death.” Verburgh agreed that the prospect of living beyond 120 was small, but recent work with mice has seen them convincingly rejuvenated. His Holiness speculated that the world’s human population would expand beyond 10 billion, which would anyway be too big for natural resources to provide for. He stirred a laugh from the audience when he suggested that a non-violent method of population control would be for more people to become monks and nuns. Selma Boulmalf declared that she would not want to live to be more than 150, which would eliminate the choice that a limited lifespan affords. “What’s more,” she said, “as a Muslim, why would I want to remain in this temporary world?” She asked His Holiness if sickness had any meaningful role in life. He told her he thought that facing pain and difficulty reminds believers of God and their religious path. He added that at her age he was a lazy student, but that just as Muslims memorize scripture, Tibetan Buddhists learn their texts by heart and study them word by word. He explained three levels of knowledge: basic understanding gained by hearing or reading, conviction that derives from critical thinking and experience arising from deeper acquaintance in meditation. Diederick Croese of Singularity University offered words of thanks to the panellists, the staff of the church, the organist and everyone who contributed to the morning’s stimulating event. His Holiness presented the various participants with white silk scarves, as is the Tibetan custom. During a meeting with members of the media immediately afterwards His Holiness remarked that technology can clearly play a significant role in alleviating physical distress, but that peace of mind and the role of moral principles cannot be overlooked. He commented that existing education sets material goals, resulting in aspirations for a more materialistic way of life with little attention to inner values. He acknowledged that the Buddha’s strictures regarding sexual behaviour are not limited to members of the monastic community, but relate to the laity too. He said he had recommended that the question of abusive Buddhist teachers be raised at a conference of religious leaders in November. He expressed disapproval of the use of technology for oppressive surveillance, but noted that the problem lies with the motivation of perpetrators and the way it is used rather than the technology by itself. He repeated that moral principles lay the basis for individuals, families and communities to live a happy life. Challenged to say why, in the face of climate change and global warming, we continue to fly, he suggested that education about climate change is essential. He also lamented America’s withdrawal from the Paris accords. While accepting that aircraft flight is a cause of pollution, he suggested that to ban flying altogether or to ban all cars would be an extreme step. He recommended instead the adoption of a more balanced, broad-minded and far-sighted solution. His Holiness reviewed the various works of art, mostly statues and paintings, that made up the exhibition illustrating the ‘Life of the Buddha’. He took particular interest in a statue of the fasting Buddha and a thangka painting of the twelve deeds of the Buddha’s life. At the end, in a small alcove, his old friend Erica Terpstra presented him with a copy of her children’s book about the Buddha’s life, to which he had contributed a foreword. When she requested him to sign her own copy, he did so on the condition that she sign the copy she had given him. He was then entertained to lunch with old friends and supporters of Tibet. Eventually emerging from the church into bright sunshine he found upwards of 300 Tibetans and other friends waiting to see him off. They included many children and His Holiness reached out to as many of them as he could, shaking their hands, patting their cheeks and laughing with them before climbing into a car to return to his hotel. 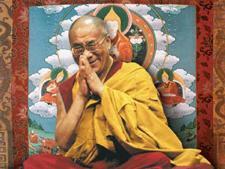 Tomorrow, he will meet with Tibetans and give a talk explaining ‘Why Compassion is Essential in Our Troubled World’.